Blue Crow Media, a publishing group that publishes architectural guides for cities worldwide, just released a map glorifying concrete structures across New York City—titled, appropriately, Concrete New York. Among the structures highlighted by the map, many will be familiar to AN’s readers. Eero Saarinen‘s TWA Terminal at JFK airport, currently being renovated into a 505-room hotel, is listed, as is the Marcel Breuer–designed granite and concrete monolith now home to the Met Breuer. Perhaps less visited is Breuer’s Begrisch Hall on the Bronx Community College campus or I.M. Pei’s Silver Towers at NYU. Concrete infrastructure also gets its due: the Cleft Ridge Span at Prospect Park (completed in 1872) is featured as well as the more recent Dattner Architects and WXY Studio-designed Spring Street Salt Shed (completed in 2015). In Greenwich Village, New Yorkers will recognize New Orleans architect Albert Ledner’s Curran/O’Toole Building, unmistakable with its double cantilevered, scallop-edged facade, formerly serving as St. Vincent’s Hospital (a landmark institution for victims of the HIV/AIDS crisis). The guide also points out historic works by Paul Rudolph, Frank Lloyd Wright, Edward Durell Stone, and many others. 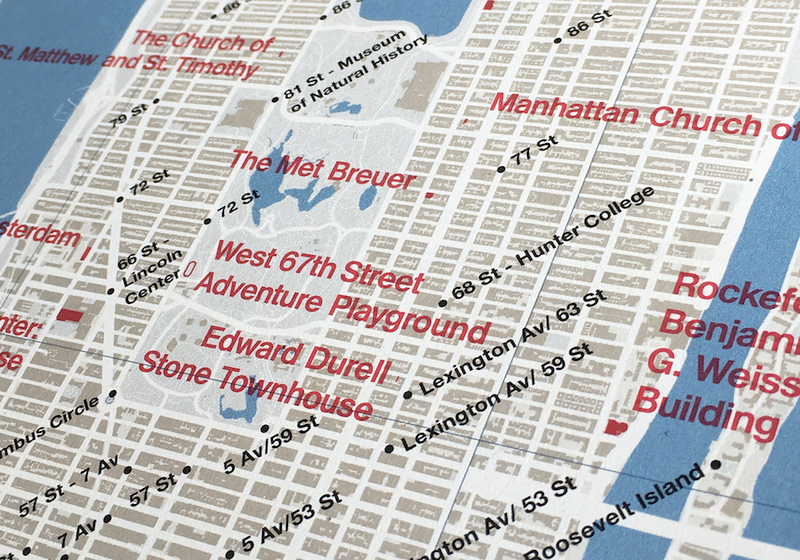 The map was edited by Allison Meier, a Brooklyn-based writer. The next guide will look at the use of concrete in Tokyo, and will be available next month. Previous maps by Blue Crow Media have examined modernism in Berlin and Belgrade, art deco in London, and constructivism in Moscow, although Brutalism remains their favorite topic to date, with maps on the subject for Boston, London, Paris, Sydney, and Washington, D.C.